As part of its activities Bai-Tushum and Partners always focuses on the interests of clients, building trust and partnership, and awards have once again confirmed the social orientation of the Company. Microfinance Centre (MFC), located in Poland, began its activities in late 1997 and now comprises 105 microfinance institutions from Europe and Central Asia. As part of its activities the Center implements various programs aimed at strengthening the capacity of microfinance institutions – members of the MFC. Members of MFC are banks, non-governmental organizations, social and commercial investors, development agencies and international private voluntary organizations. 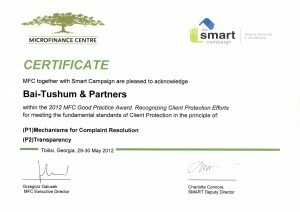 Smart Campaign – is an international campaign promoting the introduction of client protection practices in the basic culture and daily activities of microfinance organizations. The Smart Campaign steering committee includes reputable microfinance industry leaders, representing different regions and micro-finance institutions.